Pick one 6" 6.5" 7" 7.5" 8" 8.5" 9"
The original hand stamped calendar toggle bracelet…what a great way to commemorate a special day. Perfect for a wedding, anniversary, birthday, graduation, sobriety date...any day you want to honor and celebrate! This 20 gauge, approximately 1" gold-filled rectangle will be hand stamped with ANY month from ANY year (past, present or future), and then one day will be highlighted with an oval or a heart AROUND the date. Your calendar comes hangs on a beautiful 4.7 mm gold-filled chain closed with a 21.8 mm gold-filled toggle clasp. Standard overall bracelet length is 7.5" but can be ordered in any length [see ordering options]. 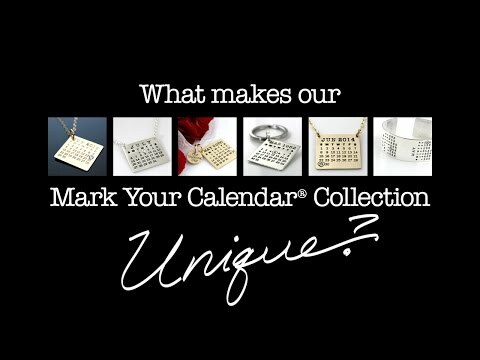 Stamping on the back: We can stamp up to 18 characters (no more than 8 characters in one line) on the back of your calendar, but it will require upgrading to a thicker sterling silver for an add'l $15. Please see ordering options. Our standard overall bracelet length for this design is 7.5", but other lengths are available [additional charges may apply, see ordering options]. While personal preference is your best guide, we’ve found a comfortable fit for this design to be 1.5” longer than your wrist measurement. Using a flexible measuring tape, measure around your wrist just below the wrist bone and add 1.5”. If your overall length ends with a quarter size, order the next size down and let us know in the special instructions box the actual size you’d like. Stamping month only, no year: We can create your calendar without a year, if you'd prefer. When ordering, simply type 'NONE' in the year box, and then in the 'Special Instructions' box let us know either the day of the week you'd like the 1st to fall on OR which day of the week your special day should fall on.